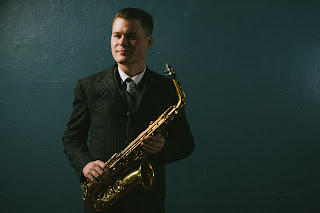 Saxophonist Jacob Zimmerman, vocalist Meredith Axelrod and guitarist Craig Ventresco will perform a unique combination of Ragtime, rural Blues, and early Jazz. Seattle-based saxophonist and clarinetist Jacob Zimmerman is an extremely versatile and integral part of the local creative-music community. Jacob studied music at the internationally renowned the New England Conservatory of Music in Boston, and Mills College in Oakland. His teachers have included Roscoe Mitchell, Jerry Bergonzi, Joe Morris and Anthony Coleman. Jacob was recognized as the “2013 Emerging Artist of Year” by Earshot Jazz. Zimmerman can also frequently be seen playing traditional jazz for swing dancers in a variety of bands all over the world. Acoustic guitarist Craig Ventresco's style is a unique combination of Ragtime, rural Blues, early Jazz guitar and traditional String Band influences. His playing is at once fiery, melodic and inventive. Ventresco has concentrated on early 20th century vaudeville, ragtime, and popular songs as recorded on obscure 78s and cylinders from the dawn of the recorded music era. He features music written by Eubie Blake, Scott Joplin, Big Bill Broonzy, James Scott, Lucky Roberts, and a Ventresco original as well. His playing was featured on the soundtrack album for the film "Crumb." Meredith Axelrod is a singer and multi instrumentalist who specializes in American roots music. As a solo artist, she has headlined her own shows at the Steve Allen Theater in Hollywood, CA, opened for the Cheap Suit Serenaders at the Freight & Salvage in Berkeley, opened for David Bromberg at the Sweetwater Music Hall, and toured as far as Australia and New Zealand. Because of her distinctive voice and style of singing, Meredith was featured on the weekly public radio series Voice Box with Chloe Veltman. Last year, Meredith was on staff and performed at Centrum Voice Works in Port Townsend. Also, she was on staff at California Coast Music Camp.